Valley Monuments is a local father and son operation in a trade that has been passed down from generation to generation gaining a greater knowledge of this craft each time. 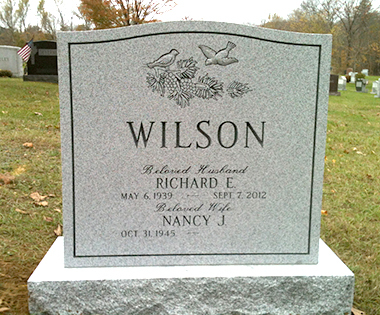 Throughout the years, our family has owned and operated businesses such as granite sheds as well as monument and cemetery lettering companies. We have come to learn that the best way to do business is to be straight forward and honest while never substituting anything for the quality of products and services. Over the years we have provided our services to many great organizations and businesses including UMASS Lowell, New England Medical Center of Worcester, “Ask This Old House”, and the Quabbin Reservoir just to name a few. We have all the latest technology to provide faster and more personalized service that customers have come to expect in this age of technology. With the aid of our computer design software we can match any monument designs, lettering and carvings. We also can match the old style craftsmanship of hand cut and chiseled lettering which is part of the trade that has been passed down to us over time. 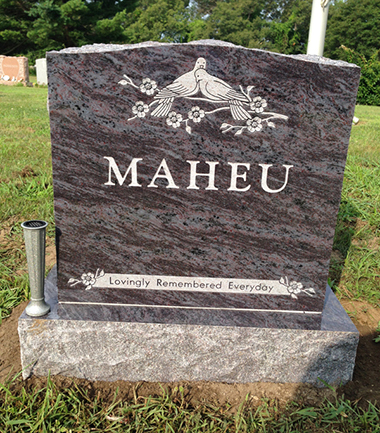 Valley Monuments has the ability to satisfy all of your cemetery needs including granite monuments, bronze and granite markers, cemetery lettering, and monument cleaning. Our team also offers a variety of products for your home or business. The landscape granite products can help spruce up your yard, house or place of business. Some of our products include granite stairs, mailbox posts, light poles, boulders, signs and benches. All of these products can be personalized by adding an engraving. In today’s economy, people are more apt to shop for the best price and service while not sacrificing the quality of the product. The fact that we are a full service monument company, in which, we do all of our work from start to finish, gives us the ability to provide a fast turnaround time and pass on substantial savings to you; our customer. Please feel free to call or stop by our store at any time to hear more about our business and the services we provide. We look forward to working with you in the future.